I haven’t commuted by bike in quite some time, but I’m taking a few days off from running so I gave it another try. And what a terrible experience it was. Overlake Transit Center is a complete joke right now. All pedestrian and bicycle traffic going between 156th Ave (i.e., most of Microsoft) and the 520 trail (including a very busy bus stop) has apparently been funneled into the small sidewalk on the south side of 40th that has been made narrower by a Sound Transit construction fence sticking into the middle of it. It wasn’t comfortable to ride alone in the middle of the day, and it’s a downright disaster during busy times. And apparently my waiting behind someone walking wasn’t acceptable to the workout warrior behind me who had to blast past us both through the grass median. The 520 trail crossings at 51st and 40th are just as bad as ever, but I lucked out and no one tried to kill me yesterday. The trail itself, however, is quite a mess. It’s still unlit in most places except for the headlights from 520 that blind you, but it doesn’t matter anyway because any obstructions on the ground are covered by leaves everywhere anyway. The plentiful bumps are rather unpleasant. Old Redmond Road is still the mess it’s always been. No one likes riding right next to fast moving traffic, and that’s why you pretty much only see spandex in the bike lane. And if you don’t cross an intersection fast enough for that spandex, you’ll get passed and cut off, which is doubly annoying when you’re then waiting behind that spandex all the way up the hill. Thanks. And when it’s finally time to turn left off of Old Redmond Road, then you get to play with cars in two lanes. Or you can make a two stage left and wait for the light twice. Redmond, Sound Transit, and those two bicyclists have made driving a better choice than biking. Shirley wrote about her bikey week, and I thought that was such a good idea that I’m going to do it myself. Sunday started with a bike ride to church and another in the afternoon to ride my horse. I rode down to the library to pick up holds and drop off due books, and rode back to the barn partially via the Cross Kirkland Corridor. It was such a lovely day! Monday was errand-day in Redmond after we finished our school work. We rode the Bear Creek Trail to the print shop to pick up a new math book for our 7yo. There’s a point where the trail ducks behind the big-box businesses there, so we stayed on the sidewalk. There’s a beg button positioned perfectly to go straight. And another that was really awkward to use to turn left. Then we rode to our next destination via the Redmond Central Connector. At Leary, I unloaded the kids so they could play in the open area there, and walked the bike the next block. They played in the bushes and on the bench-like structures and the staple racks. We rode to the kids consignment store and then across the parking lot to Trader Joe’s. 7yo decided she wanted to walk across the parking lot, so instead of putting a 2yo back in the trailer, he got to ride in the Hooptie! That may have been a mistake, since both 2yo’s have been asking to do it again since then. Tuesday we had a rainy ride to Crossroads, for what was supped to be double appointments. I missed the cancellation phone call because I was loading the bike in a hurry so we could get there on time. So instead we visited the library and had piroshky for lunch at Crossroads Mall before the second appointment. At 6.5 miles, Crossroads is a long ride for us, but it’s totally worth having the bike there with us when we are back and forth to the mall. Wednesday we were pedestrians in the morning, walking to our neighborhood shopping center to drop off a package and letters, and shop at the hardware and grocery stores. In the afternoon we biked the 7yo to her catechism class at church. Thursday was another rainy ride to fetch the 5yo home from his catechism class at church, and that was the end of our biking last week. But then Monday, yesterday, we biked the proposed Rose Hill Greenway to the CKC to have a St. Bridget playdate on another lovely day. The car did come out last week, for a trip to Evan’s Creek (our favorite kid-hiking spot) and then to tow the horse trailer. Mark would like to know when I’m going to try to hitch the Edgerunner up to it. Bakery #2: Kringles Bakery, Redmond. We love this bakery! Sadly, we rarely go there because it’s really awkward to get to. Only a block or so from a nice trail, but in between two very busy streets. and walked the bike across the crosswalk. Here’s a better picture of the crosswalk. The bakery is in the yellow house in the middle of the picture. No bike rack, though there was this interesting feature protecting the gas meter that looked an awful lot like a staple… so I locked up to it. Our haul: one lemon curd kringle, two chocolate chip cookies, one chocolate croissant (split between two big kids), one chocolate muffin (for Daddy), and a cup of jasmine green tea that was still too hot to drink when the kids were done eating. We also went to the thrift store on this trip, for Halloween costumes and other things, but ran out of time for the errands I’d intended to do. Hoffman’s is currently in downtown Kirkland, in the Park Place area, but will be moving soon as their area will be redeveloped. Park Place is actually a fine place to ride a bike. There are many cars milling about, but they mostly move slowly. The street is narrow and there are lots of people walking around. No bike rack anywhere nearby that I know of. I wheel locked the bike on the sidewalk outside. Our haul: one chocolate croissant (split between two big kids), one blueberry muffin (split between two babies), one more chocolate croissant (for Daddy), one cinnamon roll, and one cup of chai tea. We also went to the park and the library on this trip. I keep a horse near Bridle Trails, a short bike ride from our house. Over the years I’ve had phases of driving to the barn, and phases of biking to the barn. These days I’m pretty consistent about biking over, even when I need to move gear around. Horse gear is big, because horses are big, and I’ve often used the cars to move it. Last week I needed to take a clean winter blanket back, so I folded it up and strapped it to the rack of my bike. It wasn’t always this way. A few years ago when I was just getting back into biking again I had to move a blanket and was grumping around the house before I left about how I’d have to drive to the barn to take the blanket there. Secretly I was looking for an excuse not to bike, but then Mark pointed out that I had recently acquired a bike trailer, so I certainly had a way of transporting the blanket. With no excuses left, I hooked up the trailer, put the blanket in it, and I was on my way. On the way a guy on a road bike zipped past me while I was chugging up a little hill. He then turned and gave me a big grin and a thumbs up before speeding away. I figure he must have been a family biker too, but he couldn’t see in the trailer so he didn’t realize that I wasn’t towing children that day, but a horse blanket. Now we have a cargo bike, and the blankets have ridden in the bags, but I prefer to use my little bike when I can, because the big bike is, well, big. I still do use the car for buying feed, because while it might be possible to transport 200 pounds of beet pulp with a bike, I can’t do it with four children! who wants to bike there? 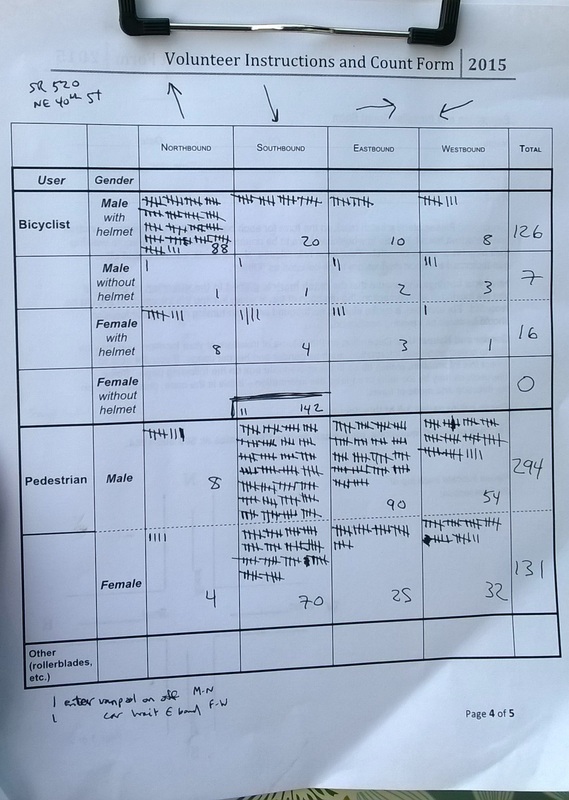 Thoughts on Ped/Bike Counting at SR-520 Trail and NE 40th St. I (and likely anyone else biking, walking, or running) have long disliked (understatement) the crossing at 40th on the 520 trail. The statewide bicycle and pedestrian count gave me an excuse to watch it for two hours as opposed to the occasional first-person crossing view. Of course it was also good to be able to provide counts for this important intersection. The panniers turned out to be an integral part, blocking the chair from falling off either side of the rack. Michelle asked why I didn’t just toss a collapsing camp chair into a pannier, and I’m going to stick with the reason that I wasn’t going camping. Having this large thing strapped to the back of the bike turned out to be a fascinating (and wonderful) experiment. I’m not sure whether it was different enough to actually get the attention of drivers or if they were worried it would fall off and scratch their cars, but I’ve never had anywhere near that much room while using the bike lanes on Old Redmond Road. I would estimate an extra 3-4 feet. In fact, I started to worry that someone would hit the center median and bounce back towards me. Fortunately, that didn’t happen. The thing that I was mainly interested in was whether my perception of danger was something specific to me (and, err, anyone else I’ve ever talked to about it). And the answer is clearly no. This intersection is terrible for people walking and biking. Luckily there were no collisions. @CrosswalkView did you count my near miss w SUV driver w no intention stopping on red? Or not cause I know not 2 expect drvrs 2 stop on red? If memory serves me correctly, the car actually was stopped. It was the moment when the ped/bike signal changes. All is calm in the intersection for a moment, so often drivers start right turns on red. And one nearly did but then stopped. My guess from the movement is that the driver took his/her foot off the brake but saw Glen before hitting the accelerator and stopped. The car ended up slightly in the crosswalk. I think my original terminology not calling this a “near miss” was incorrect; it was just a “near miss” with the collision avoided in a different way. I didn’t have a lot of time to take pictures or videos, but I took a few. 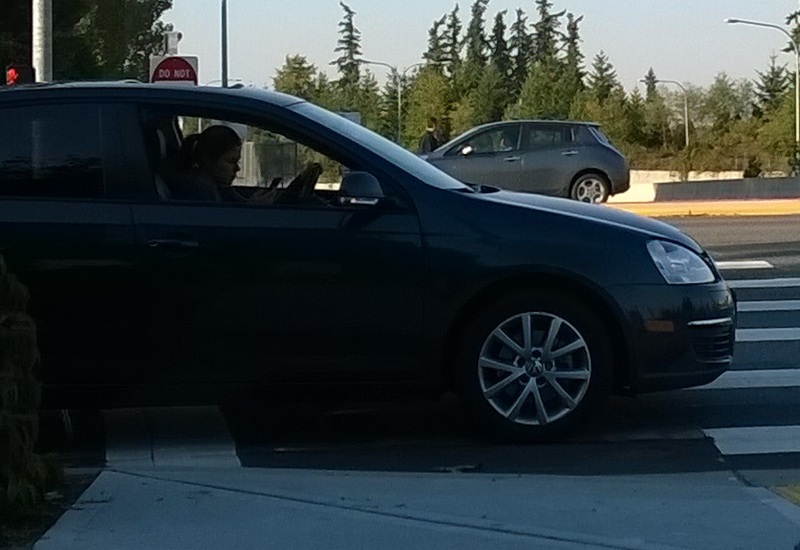 For bonus points, she was then talking on the phone while driving around pedestrians in the crosswalk on the onramp. The bus was actually turning left, though it had to swing out so far that it looks like it is going straight. I don’t like driving in that lane! The other main thing I noticed is how inefficient the intersection is. It’s bad enough that each person (and almost always one person) is surrounded by a vehicle taking a lot of space (“mostly empty metal boxes” as we call them) as well as buffer space between them, but the signal timings are terrible. The transitions take a really long time, which of course are what lead to really long phases and a miserable experience for those on foot or bike. I didn’t have time to do measurements while counting, but the next day in the morning I saw two cars go through the intersection in the last 25 seconds of a phase. That’s the same utilization as the two of us that went through on the ped/bike signal. The ped/bike phase only looks less utilized because we weren’t dragging 1-2 ton vehicles with us. I am so glad to be doing what we need to do on foot and bike this week. I feel like I’ve spent way too much time in the car lately. Monday we had a million errands in Redmond. Going by foot is the best way to do a million errands, but when that’s too far the bike is the next best thing. I was so pleased with how much we got done and our efficiency in doing so. We got to use the shiny new bike rack at the eye doctor (pic from last week). But the print shop didn’t have a bike rack. They did, however, have access out the back to the Central Connector trail. It’s so simple – just an opening in the fence, some paint to keep people from parking cars in front of it, and a short stretch of asphalt provides much improved mobility. We rode every trail in Redmond, and it was such a pleasant trip. But then that afternoon was a disaster of not napping and I declared that we were never going anywhere ever again and cancelled the rest of the week. Tuesday we didn’t leave the house and it was wonderful. Wednesday we were out of groceries, but we live across the street from the grocery store, keeping the grocery shopping from feeling insurmountable. We walked outside and found a garbage truck with a grabber crane emptying the dumpster at the construction site down the street. Fifteen minutes later we continued on to the store. That afternoon the six-year-old had her class, so we biked over to the church in the rain (it’s been a while since our last rainy ride) and then over to the barn to tend my injured horse. Thursday morning the four-year-old has his class, so we biked to church again. We locked up the six-year-old’s bike in front of the parish center and rode down to the library. The babies proved to be more able to contain themselves and only pulled down a dozen or so books instead of emptying the shelves, so we actually had a nice time, and the six-year-old got a chance to read all of the Fancy Nancy books that I won’t let her bring home. On the way home we stopped at the big construction site, and then at the Poem Post. Do you have a Poem Post in your neighborhood? It’s the best! This afternoon, after naps (so as not to mess with them), we are driving to Target. I’m not sure I can think of a place I’d like to go less, but we have some work to do. Tomorrow I will work a Bike to Work Day station, and we’ll go to the Redmond Bike Bash in the afternoon, after naps. It’s not so bad to not go anywhere, when there’s so much so close.